It is important for African Greys to have a variety of food that provides diet and nutrition that they need for a healthy life. There is no exact formula for feeding them as there are many differing opinions out there. However, what is important is to provide a balanced diet for the African Greys. We should provide them a variety of fresh, wholesome vegetables. It could be a challenge to get them to eat their vegetables at first, so we might have to spend some time encouraging them. 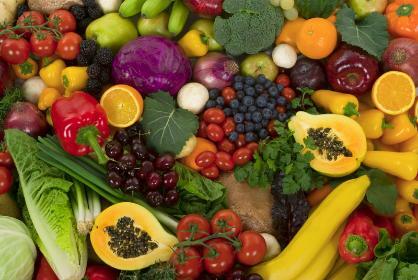 It is best to provide either 5 or 6 types of fruits/vegetables daily. Make sure either a type of fruit or vegetable has a high vitamin A content in it, such as: papaya, sweet potatoes, yam, cantaloupe, and pumpkin as Vitamin A aids in Calcium absorption. It is also important to include vegetables that has high Calcium content (please refer to list below). Seeds are high in fat and are not healthy diet for the birds. It is also possible to use a pellet diet, preferably an organically processed pellet, and not one that has additives, such as artificial colouring and flavouring. Below is a list of recommended food & vegetables. Note: Citrus fruits should never be given more than 4 to 5 days a week. One of the most common deficiency in African Grey is Vitamin A or beta-carotene, hence food with beta-carotene should be provided daily. Calcium is essential for healthy bones, nerve and heart function, as well as muscle contraction and blood clotting. Birds should be checked annually for their calcium level. Water is a necessity and the birds must have access to fresh water in a clean container daily. Do not give distilled water as they lack minerals and nutrients. TOXIC FOOD - DO NOT FEED THEM TO BIRDS !!! It is important to know the type of food that are harmful and / or fatal to Greys and to educate everyone to be aware not to feed them these. Avocado (toxic) - Keep all avocado products, including guacamole, away from your Grey. The skin and pit of avocados have been known to cause cardiac distress and eventually heart failure in pet birds. Chocolate (toxic) - We all love chocolate but this is a definite treat NOT to share with your bird. They get what is known as "chocolate poisoning" which first will affect the bird's digestive system and cause vomiting and diarrhea. As the condition advances, their central nervous system is affected, causing seizures and eventually death. Tomato leaves, vines, stems (toxic) - While it is perfectly fine to give your bird a tomato to eat, the stems, vines and leaves are highly toxic to them. Any time you give them a tomato, make sure it has been washed and sliced, with all green parts removed. Coffee / Caffeinated beverages - Coffee, soda, tea and other caffeinated beverages are extremely hazardous to your bird's health. Caffeine causes cardiac malfunction in birds and is linked to increased heartbeat, arrhythmia, hyperactivity and cardiac arrest. Share some fruit or vegetable juice with your bird instead. Alcoholic beverages - Responsible and caring bird owners would never think of giving their bird an alcoholic beverage, but remember our birds do roam around our homes and have been known to help themselves to food and drink. Alcohol poisoning can be fatal as alcohol depresses the organ systems of birds. Keep all alcoholic beverages far away and out of reach of your bird. Dried Beans (toxic) - Raw, dry beans can be extremely harmful to your bird. Uncooked beans contain hemaglutin, a poison that is very toxic to birds. Make sure to thoroughly cook any beans before giving to your Grey. Pits or seed of many fruits - many seeds and pits of fruits, such as apples, cherries, pears, peaches and apricots, contain trace amounts of Cyanide and should NOT be given to your bird. Share the fruit part but also be conscious that there may be pesticides on the fruit's skin. Thoroughly wash and core fruit before giving it to your bird. Rhubarb – the leaves of the rhubarb are poisonous to birds. They contain high concentrations of oxalic acid which is an intestinal irritant. Large doses are fatal. High-fat, fried, salty or high-sugar foods - these foods can cause multiple health problems in birds. Salty or high-sugar foods cause such problems as dehydration, excessive thirst, kidney dysfunction and death. High fat in the bird's diet leads to obesity and may result in lipomas (fatty tumors), lipemia (fat in the blood), and hepatic lipidosis (fatty liver disease). Mushrooms - A type of fungus, mushrooms have been known to cause digestive problems in birds. It has also been found that the caps and stems of some mushroom varieties can cause liver failure. Onions - Limited amounts are generally regarded as acceptable; but excessive consumption of onions cause vomiting, diarrhea and other digestive problems in birds. It has also been found that prolonged exposure to onions can lead to a blood condition called hemolytic anemia. This condition is followed by respiratory distress and eventually death. Nutmeg - this spice contains a narcotic called myristicin, while not usually a problem for humans as we only eat tiny quantities at a time; a bird that consumes nutmeg, suffers from dizziness, nausea, and vomiting. Peanuts - these nuts are often contaminated with aflatoxin, a fungal toxin. Aflatoxin is carcinogenic and causes liver damage in birds, squirrels, and no doubt other animals as well. Roasting the peanuts reduces aflatoxin but does not eliminate it entirely. Anything that you question or are unsure of - use common sense, just don't feed it to your bird as it's not worth taking a chance on their health / life.